As I’m spending my Easter long-weekend reading through the many, many ENnies submissions we have received so far, I thought it was a good time to take a break, drink a coffee, and talk about a few of my thoughts for this year. First, the deadline for submissions this year is May 4 (details on the ENnies website). That means the office has to have your digital submission by end-of-day, or your package has to be postage/shipper marked that date in order to still qualify. We get so many submissions every year that this is not something the office makes exceptions about, so if you’re planning to submit please don’t play chicken with this deadline. As busy as I am cramming everything in my eyeholes, I’d hate to miss out on something amazing because it missed the deadline. And there is a lot of amazing this year! I prided myself on a wide and varied diet of TTRPG reading before becoming an ENnies judge. But this past year has been a rich smorgasbord of game material, both from the usual industry contributors, as well as independent writers and publishers. To everyone who submitted: thank-you for that. As a judge, it has been an absolute joy to read everything we have received. As a Game Master, everything we received has and will continue to inform my gaming sessions for a long time to come. Thank-you especially to the folks in our community who are or feel marginalized, and submitted. That couldn’t have been an easy decision to make, and I know many have chosen not to submit to the ENnies for various good reasons. But I appreciated the submissions we did receive, and I can say that without exception your submissions not only broadened my perspective on what TTRPGs can be, but brought me such joy to read. The imagination and fierce vulnerability on display is a an example of the best of TTRPGs. So if you are a marginalized creator in our hobby, and you have something that otherwise meets the ENnies submission criteria, please please please send it in! We want to see it, and speaking for myself, I’m hungry for it. Please note, I’m purposely not defining what “marginalized” means in this context. I don’t feel it’s my place to do that, and if I were to just partially list the groups I think are marginalized, someone could take that as a reason to self-exempt themselves (“Well my group isn’t listed, so I guess the %&$hole didn’t mean me!”). One thing I’m finding it the hardest to select for is the Judges Spotlight. Every year at the ENnies, each judge gets about 10-15 minutes to talk about a single product that was a stand-out for them. It can be for any reason, and that freedom is actually the problem. There is so much that stands out to me for various reasons and I’m having a hard time narrowing it down to just one. I mean, I’m going to have to, but ugh! Why did you all have to make such good games?! Okay, I came up for air long enough to urge folks to get submissions in. Now it’s back to cramming TTRPG goodness in my eyeholes. And earholes, a good chuck of today is giving the podcast submissions a good listen. If you want to shoot me questions or comments, you can do that below, or over on Twitter. My DMs are open, or you can publicly message me and I’ll respond as best I can. I was just going to add this to my previous post regarding Uncaged Volume One, but there was just too much! The hardcover version is now available through Drivethru’s print-on-demand. And there is a special bundle price if you want the PDF and print copies together. Which is what I did; the PDF is easier to use at the table, and the print copy is easier for me to pick up and read through. Plus it’s way easier to get the print copy signed at cons. Sharpie is just so hard on my laptop’s screen. Also, a huge thank-you to everyone who purchased a copy so far. Thanks to you, Uncaged Volume One is currently a Platinum Best-seller on DM’s Guild, and steadily working its way to Mithril. That’s all down to the support you have shown this amazing project. If you have purchased Uncaged, please also leave a review on the product page, as active reviews help keep it in everyone’s eye. It’s not a surprise to me, having read through it, that Uncaged is enjoying an average of five stars. If you have a moment, stop by and tell Ashley Warren how much you appreciate the work she has done in pulling these anthologies together. And if you are so inclined to thank her in a more tangible manner, you can check out her website for other things she has worked on, and purchase whatever strikes your fancy. As well, Uncaged is partnering with Non-Toxic Gaming to host a charity stream benefiting RAINN. The community around the Uncaged Anthologies is so wonderful, it’s probably one of the best parts of being part of this project, to be honest. Details at the link, but keep your day free and your wallet full for that. What else? Uncaged Volume Two is on track for its April release, so get ready for more adventure goodness. And if you’re going to Gen Con, keep your eye out for an Uncaged panel on the schedule; no details yet but it will be a good time and I plan to be in the front row with all the enthusiasm of a winning sports team’s biggest fan! I’ll leave the airhorn at home, however. Good morning! 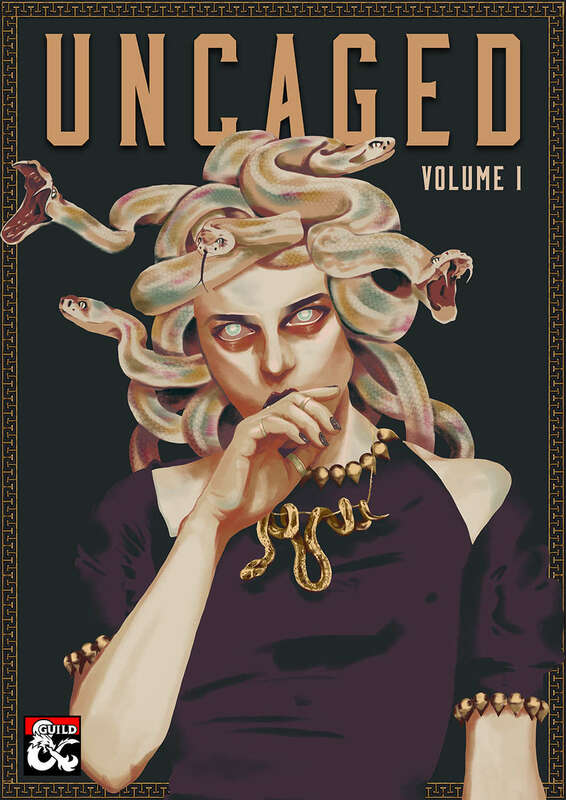 I won’t bury the lead: I edited a few of the adventures featured in Uncaged Anthology, which is available today over at the DM’s Guild! I was lucky enough to see this project come into existence in real time on Twitter. It started as a question posed by Ashley Warren about a series of mythology-based one-shots. The response was amazing, and Ashley took the wheel and brought the massive ship that is any anthology project onto an even keel, and it was underway. When the call went out for editors I eagerly put my name in, and was lucky to be asked to take on some of the adventures. I only grabbed my copy this morning, so expect an in-depth review later. But if the two adventures I work on were any indication of the overall quality (and I have every reason to believe it is so), you will want to grab this book post haste. It is a beautiful book packed with one-shot D&D adventures which could be dropped with ease into your campaign. Given the mythological theme which binds them, they could even form the basis of a campaign, as your players explore the myths and legends of your world. I’m really excited to read this and get some of these adventures on the table. Even more exciting, this is only Volume One, so expect even more adventures to come! Once you’ve had a chance to pick up a copy and look it over, I hope you’ll stop by and let me know which are your favourites. And should you be looking for an editor for your TTRPG project, well, I have a page about that. Let’s talk! Over at The Rat Hole today, I revisit a project I started and stalled on, and have now started again. It’s time to turn my game room into a proper, comfortable game space. If you have a gaming space in your home, you might find some tips and tricks helpful as the series progresses. Tomorrow I’ll have a thrilling announcement regarding a project I worked on recently, so stay tuned! This month’s RPG Blog Carnival topic is Divine Worldbuilding, which comes at a fortuitous moment as I have had to begin designing a pantheon or two for my home campaign. I really should have given it thought much sooner, as I have two clerics and a paladin split across two groups. When it was just my home game, and I wasn’t looking at publishing the setting, I was fine hand-waiving the details and going with the gods as presented in the 5e PHB. But as I am going to publish this campaign world as a setting book, it seemed appropriate to make some decisions about the deities of my world. Not only is it better to do it now, before the characters get much higher in level, but these details can then inform and even form the basis of future plots. Today I’m going to outline the first three big questions I ask when creating a pantheon from scratch, so you can see how you might get started. In articles later this month I’ll outline the next steps from there, and we’ll look at one of my finished pantheons, to give you an example of how to flesh out the pantheon for play. Let’s start! 1) Deities of What? – This question encompasses a bunch of more specific questions. In our own history, we can see that deities came into being to help explain aspects of the world we didn’t understand. So the usual starting place would be to look at the elemental forces of your world: fire, lightning, wind, water, and so on. Are there moons in your night sky? There’s probably a deity or deities associated with them. Is there an especially tall mountain, or an always smoldering volcano? Deity. Deities were also associated with common aspects of life which could be affected by unknowable or poorly understood influences. Thus we had deities of the hunt, for instance, because we needed someone to thank/blame when hunting was good/bad. When we later developed agriculture we had a deity for that, for much the same reason. Death deities are probably the most common across pantheons, as death and what happens when we die is probably the great unknowable. Once you have a list of “primordial” deities, look at your campaign world and figure out where you are in your campaign’s history. If you’re running a campaign set in a rough, pre-history type setting, you might actually be done. But if the societies in your campaign world are more developed, chances are they’ve also expanded the influence and portfolios of their deities. That old deity of fire, for instance, may also be the new deity of the forge. Depending on the flavor of Death deity in your campaign, maybe its portfolio has expanded to include law and judgement in the mortal realm, as well as the hereafter. You may even need to create more modern deities. Early civilizations wouldn’t have needed a Deity of Trade or a Deity of Invention, for instance, but your current culture might. And one final question, are you going to use a pantheon or not? While there may have once been primordial deities worshipped, perhaps there is now just a single deity encompassing all things to all people. But is it a true monotheism, or do folks also believe in lesser deities which support the main deity? The Catholic faith is a good example of this; while it is considered monotheistic (God), there is the Holy Trinity (Father, Son, and the Holy Spirit), as well as what amounts to a pantheon of Saints, each a patron of some aspect of the world. 2) How do They Look? – This may seem superficial, but it can be an important question to answer because it will determine a lot about the visual aspects of faith in your world. Just think about how much art has been created or influenced by our world’s religions. As before, this question holds many more. Do the deities appear as paragons of the people who worship them? Do they appear gendered or non-gendered? Are they simply anthropomorphisms of the aspect they represent (ie, the Deity of Fire appears as a column of flame to their worshippers, the Moon Deity appears as a bright moon beam striking the ground or altar)? Do they appear at all? Maybe the deities in your campaign world are formless, and there are no direct representations of them. As part of this, ask yourself if folks are even allowed to show representations of the deities. Maybe images of them are restricted in some way, or even forbidden. Perhaps the opposite is true, and everyone has their own personal idea of what their deity looks like, all equally valid. And does the deity in question have opinions on all this, or does it remain aloof on the question of its appearance? The answers to these questions will inform aspects of your campaign world like: what do holy symbols look like? How are temples constructed and decorated? How do the clergy (and therefore your clerics, paladins, druids, and sometime warlocks) dress, both for everyday and for adventuring or battle? Can you tell the worshippers of one deity from another, simply by looking at them? Do any of the faiths engage in tattooing, branding, or scarification? 3) Who Worships Them? – The faithful, of course! But who is that? Is the deity species specific, and do they only allow worshippers from that species, or can anyone pay homage? Is the deity gender-specific? Is there a test to join the faithful, some aspect in which a potential worshipper must prove themselves to be a paragon? Or maybe you don’t choose the deity, the deity chooses you, and you can only be one of the “true faithful” if you have received a direct invitation from that deity. And an even bigger question to answer: are the Deity and the Church on the same page? The Church may have some ideas about who can worship and who is truly faithful, divorced from the Deity in question. If so, what does that look like? Are ceremonies to that deity antagonistic, bordering on blackmail (“Look at this juicy faith we have for you! Give us spells and you can have it!”)? Does the deity sneak around behind the backs of the “True Faithful”, bringing those the Church considers unworthy into the faith? Maybe the situation is so antagonistic, ceremonies look very much like we’d imagine the summoning of a demon would, with the worshipper weaving protections and bindings to force power from the deity. These three questions, and the little questions buried inside, allow you to piece together a framework for your deities. You can do this for each of the species in your world (and thus have human, dwarf, elf, etc pantheons) or do it once for all. Once you’ve put together this framework you can start adding to it, fleshing out the details for each deity. And that’s where we’ll pick up in the next article. How do you go about creating the deities for your campaign? Comment below! I wrote a thing over The Rat Hole today, talking about a recent tweet by Matthew Mercer and the latest surge of TTRPG gatekeeping. Give it a read and let me know what you think in the comments, here or there. I’ll see you Wednesday for our regularly scheduled posting! Bit late to the party, I’ll admit, but welcome to 2019 everyone! This past year was…interesting. Definitely low points, some personal, some societal. On both fronts, though, 2019 seems to offer hope, so I choose to focus on that. You’ll start to notice some small changes around the site in the coming weeks and months. I’m committing myself to a three post a week schedule, which will shake out to be a post over at The Rat Hole on Mondays, with two posts here either W/F or Th/Sa. I’m a happier Renaissance Gamer when I’m writing, so I’ve made time for myself to do that every day. Two new projects are starting this year as well. I have promised myself that 2019 is the year I publish something for TTRPGs, hopefully several somethings. I have a short side-trek adventure ready for other eyes and playtest, that I hope to publish to DriveThruRPG or DM’s Guild in February. I’ll talk that up more when it’s ready, but as a teaser, check out the snazzy logo for my imprint, Prairie Dragon Press. It’s one of two logos by my pal and local designer Mike Kendrick (@ironcladfolly on the Twitters), and if you haven’t seen his work before I highly recommend it. He also did some poster art for the Pure Speculation Festival, and he is super talented and a joy to work with. The second logo is for something I soft-launched last year, and am ready to push further this year. The Canadian Library of Roleplaying Games is going to be a bit more public this year. While I will continue to build up from my rather small collection of books, art, and memorabilia, I also want to start on the library’s other purpose, outreach and education. To start that will mean working with local cons and such to set-up displays and demonstrations. But eventually I’d like to expand that to the rest of the province and Western Canada. I’m also building out the Library’s website, including a database of what’s in our collection. So look for more of that in the coming months as well. And while I’ve threatened to do it for years, I think this year is when I’ll also start podcasting. Between the new publishing imprint and the Library I’ll certainly have enough to talk about. In fact, the podcast will likely be focused on the Library, with occasional updates on other things. There are all sorts of folks I’d like to interview and chat with regarding TTRPG history, specifically Canadian industry history, and I hope that will be of interest to to other gaming nerds. That’s all the updates I have right now. Monday will have a link to the Rat Hole article when it’s up, and regular service begins this coming week. Welcome to 2019, everyone! May the dice be ever in your favour!